Soft and breathable in fine, cotton rich fabric, and perfect for wearing with boat shoes, deck shoes, athletic and sports footwear of all kinds… in fact, any shoes that you want to give that no-socks look to! Our SockShop Mens Gentle Grip Cotton Invisible Socks come as a pack of three pairs, with a comfort fit and easy-going feel. Internal heel grips keep these low profile under ankle socks from slipping underfoot, while cuffless edges and a cushioned back ensure that the socks stay hidden, and comfortable. 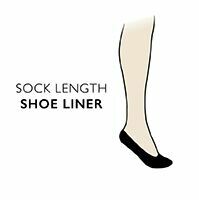 Flat hand linked toes for smooth seams mean that Gentle Grip Cotton Invisible Socks remain kind to your toes in even in the closest-fitting shoes.